A selection of animal welfare information resources at the San Diego Zoo Global Library and online. 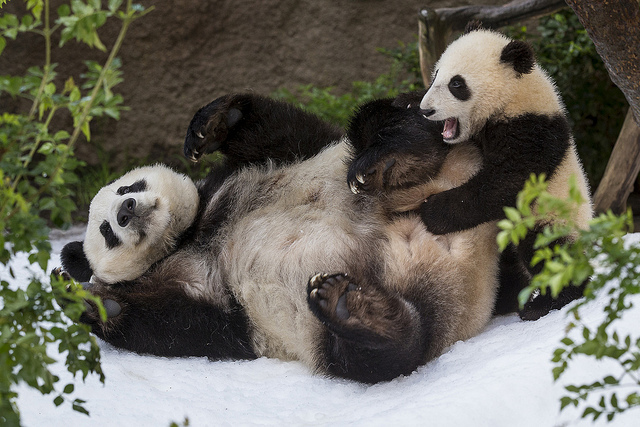 Giant pandas play in snow at the San Diego Zoo. Environmental enrichment is an important tool for maintaining health and welfare, keeping animals stimulated and active, and promoting natural behaviors. ©San Diego Zoo Global. All rights reserved. Welcome! This is a guide to finding animal information at the San Diego Zoo Global Library and online. Five focal points create the lens with which San Diego Zoo Global makes animal management decisions, and are central to our mission of ending extinction. Providing conditions in which animals can exercise control and make choices to avoid suffering and distress, and make behavior meaningful. Using current scientific knowledge along with SDZG best practices to evaluate if the animal(s) are being given the opportunity to make choices related to spatial organization, and training programs are based on the principles of positive reinforcement. Enrichment and exhibit conditions should include problems solving and opportunities to make choices based on varying degrees of challenge. Quality spaces and appropriate social groupings will be provided that encourage species specific behaviors at natural frequencies and of appropriate diversity while meeting social and developmental needs of each species in the collection. Using current scientific knowledge along with SDZG best practices to evaluate if the animal(s) are being given the opportunity to express meaningful behaviors at a frequency that meets the needs of the species natural history. This includes but is not limited to appropriate developmental conditions (social/cognitive), enriched social environment, complex environmental experiences, lack of maladaptive behaviors, and a strong and responsive relationship with the environment (exhibit/management technique). Rapid diagnosis and treatment of injury or disease while providing supportive environments that increase the likelihood of healthy individuals. Using current scientific knowledge along with SDZG best practices to evaluate if the animal(s) are given the benefit of a clear line of communication between all departments responsible for the care of the animal(s). Evaluate if there is a clear line of roles and responsibilities, and that all parties involved are working within their area of expertise as part of a collaborative effort. An appropriate environment including shelter and species specific substrates that encourage opportunities to self-maintain. Using current scientific knowledge along with SDZG best practices to evaluate if the animal(s) are being given the opportunity to maintain their own optimal health and well-being with appropriate environmental factors related to thermoregulation, skin/fur/feather condition, and joint/muscle/cognitive health. Fresh water and a suitable, species-specific diet will be provided in a way that ensures full health and vigor, both behaviorally and physically. Using current scientific knowledge along with SDZG best practices to evaluate if the animal(s) are being fed an appropriate food in a way that encourages natural feeding behaviors, physically and temporally. SDZG's intranet portal, Insider Online. What is the Animal Welfare Alerts service? SDZG staff are welcome to subscribe. Email library@sandiegozoo.org with your name, email address, and a request to be added to Animal Welfare Alerts. How do I access full text articles? Click on any URL or DOI link in the alert to download a PDF. If you're working offsite without VPN, or no link is included, please email a request to library@sandiegozoo.org.